Most Americans do not regard immigration as a pressing concern – either for the nation or for their local community. Just 4% of all Americans volunteer immigration as the most important problem facing the country, and about the same number (3%) point to immigration as the biggest problem facing their community. Yet there are pockets of concern. In the survey of five metropolitan areas, immigration was viewed as the most serious local problem only in Phoenix. But even there, when respondents were asked in an open-ended question to identify the most important problem in the community, fewer than one-infive (18%) volunteered immigration. 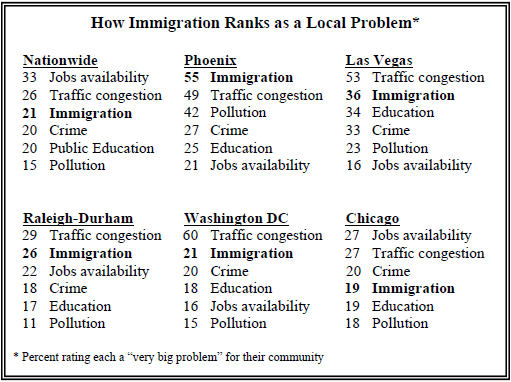 On the other hand, when asked to rate the impact of immigration among a list of five other local concerns, such as crime, traffic and the availability of jobs, 55% of Phoenix residents characterize immigration as a “very big” problem – the highest percentage for any issue – while another 23% say immigration is a “moderately big” local problem. In Las Vegas, which like Phoenix has experienced an influx of immigrants in recent years, there also is considerable concern over immigration. More than a third of Las Vegas residents (36%) say immigration is a very big local problem, and 28% think it a moderately big problem. However, immigration rates as less of a concern for the national public or for people living in three other American metropolitan areas with large and growing immigrant populations – Raleigh-Durham, Washington DC, and Chicago. Just 21% of Americans in the national survey say immigration represents a very big problem, while 20% say it is a moderately big problem. In Raleigh-Durham, a majority (56%) views immigration as at least a moderately big community problem, but fewer than half of Washington DC residents (44%) express that opinion. For residents of the nation’s capital, traffic overshadows all other local problems; fully 60% see traffic congestion as a very big problem, roughly triple the number who say that about immigration (21%), crime (20%), or education (18%). Chicago residents, in particular, express only modest concern over the effects of immigration impact on their community. Only about a third of Chicago residents (35%) see immigration as a very big or even a moderately big problem. That compares with 42% of Chicago residents who say immigration is no problem at all for their community and another 19% who view it as a small problem. When the general public is asked its views about a comparable list of problems facing the nation, immigration ranks as a middle-tier issue. Overall, 42% of the public rates immigration as a very big problem facing the nation, placing it behind the health care system (55%), terrorism (50%), crime (47%) and corrupt political leaders (46%), but a bit ahead of environmental pollution (39%) and the availability of goodpaying jobs (37%). On a national level, immigration concerns are greatest among senior citizens, those with a high school education or less, and white evangelical Protestants. Roughly half in each of these groups rates immigration as a very big national problem. As previous Pew surveys have shown, there are differences within both major political parties in views about the seriousness of the immigration problem. Roughly half of conservative Republicans (49%) view immigration as a very big national problem, somewhat greater than the percentage of moderate and liberal Republicans who express this view (41%). Democrats are even more divided over the seriousness of the problem presented by immigration. Fully twice as many conservative and moderate Democrats (46%) as liberal Democrats (21%) say immigration is a very big national problem. The public overwhelmingly views illegal immigration, rather than legal immigration, as the bigger problem facing the U.S. Six-in-ten Americans say illegal immigration is the bigger problem, compared with just 4% who say legal immigration. However, a sizable minority (22%) believes both illegal and legal immigration are equally worrisome. Just 11% say neither represents a big problem for the U.S. This balance of opinion is mirrored in the five metropolitan areas experiencing high levels of immigration. Solid majorities in each of the regions surveyed say illegal immigration is a bigger problem than legal immigration. And about one-in-five in each city believes that illegal and legal immigration are equally severe problems. Biggest Threat: Jobs, Culture or Security? Americans draw distinctions about the concerns they have over both legal and illegal immigration. Legal immigration is mostly seen as a threat to American jobs; 41% of those who are more worried about legal immigration (or say both forms of immigration are equal problems) say their biggest concern is that legal immigration will hurt American jobs. By contrast, people who see illegal immigration as a bigger problem (or say both equally) are divided on their concerns. Three-in-ten (31%) say illegal immigration hurts jobs, but nearly as many (27%) say it raises the danger of terrorism, and 16% say it contributes to crime. Terrorism and crime are less frequently cited as concerns by those who say legal immigration is a bigger problem. The idea that immigrants hurt American customs or the American way of life is a concern, though not a paramount one, of those worried about each form of immigration. About one-in-five (17%) of those more concerned about legal immigration say it is their biggest concern. Just one-in-ten (11%) of those more concerned about illegal immigration feel the same way.